The towpath improves, bridge 71B is a mini Humber, and then there is the Grafton Street Aqueduct. The railway can now be heard and soon seen as you approach Wolverton. Though with an anglo-saxon heritage, Wolverton is a railway town and there’s an impressive mural on the left to prove it. The facia of old railway workshops on the left disguises the fact that they have been gutted and regenerated. Following this development of ‘luxury first class living’ there’s a pleasant cutting with moored boats between bridges 69 and 68 which has the Galleon (formerly Locomotive) pub above it and Galleon (formerly Old Wolverton) Wharf beyond. You are now leaving Milton Keynes and it hasn’t been too painful. Once past the wharf you walk straight through the middle of the medieval village of Wolverton with a motte and bailey castle on the left and the Ouse Valley Park containing all manner of wildlife opposite. A ¼ mile further on is the Iron Trunk Aqueduct crossing the Great Ouse as you move from the Home Counties (Buckinghamshire) into the Midlands (Northants). There’s now a long straight with Cosgrove Leisure Park glimpsed between the trees on the right, what looks like hundreds of mobile homes gathered around a lake. 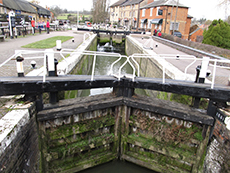 The Old Stratford and Buckingham Arm of the canal is reached at Lock 21, this allowed goods to be transported to and from the A5 (Watling Street). Go a little further and look out for the sign to the Barley Mow that entails walking through the horse tunnel. Not too much distant is the ornamental bridge, an over the top effort that was constructed on the insistence of the landowner. Cross to the other side and you head out into the country with the canal curving above flat country on the right. It’s very peaceful and only intermittently are there any houses to be seen. The Navigation Inn is above Castlethorpe Wharf bridge 65 and leaving the Taverners Boat Club behind, you cross bridge 64 to the other side and continue past Thrupp Wharf Marina. There’s more noise when the A508 gets a too close for comfort but the path is grassy and wide as you get to bridge 60, with Yardley Wharf and the Kingfisher Marina and winding hole. Further on at bridge 57 a diversion is available to Grafton Regis. When the canal wriggles to Stoke Bruerne, and the River Tove starts to run parallel, there are several weirs to cross, the most impressive has the river running underneath and then feeding the canal. There’s a few boats moored near the entrance to the river and then Stoke Bruerne Bottom Lock 20 kicks off a series of locks with the village coming into view. The wetland reserve before lock 15, formerly used to extract clay, contains rare fauna and flora and also takes in a filled in canal branch. Also worth a visit is the Navigation pub on the opposite side. Top Lock 14 has the Boat Inn on one side and the canal museum and curry house on the other to keep the tourists happy. To keep the canal buffs satisfied there is a redundant lock from the 1838 widening scheme complete with decrepit boat. About a third of a mile further on there’s the 3076 yd Blisworth Tunnel, the Grand Union’s Achilles Heel. Even though a contract was awarded in 1793, due to engineering and financial difficulties cargo had to be unloaded and then use a tramway to the other side of the hill until the tunnel's opening in 1805. Celebrating that the canal was now fully navigable were 5000 people at Stoke Bruerne and then 120 sat down to an excellent meal at the Bull Inn at Stoney Stratford. 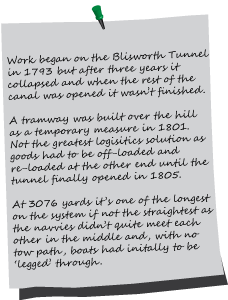 The tunnel has no towpath so you have to walk along a track and then Stoke Road to the north portal where there is a pleasant cutting leading to Blisworth. On the far side of the village is Candle Bridge. Once the houses disappear the towpath deteriorates and the traffic noise increases towards the A43 and Blisworth Marina. After crossing bridge 48 you reach Gayton Junction where the Northampton Arm departs, connecting the Grand Union with the River Nene. The turnover bridge 47 leads to the other side of the canal and rural calm albeit adjacent to the railway from bridge 46. Except for admiring passing trains the walker has to strive fairly hard to find anything of interest to text home about, perhaps a bizarre collection of sheds and play equipment at an establishment offering cheap dog sitting might feature in a short message. At this point you realise it is probably the first time in seventy odd miles that there is no traffic noise. That is until a car sounds its horn going over bridge 45. Just past the bridge is a memorial to Pippy the canal dog who died in 2007 but about whose demise there is no other information. Traditonally where a lady made her living selling candles to boatmen to guide them through the tunnel. When the tunnel was refurbished in the 1980s and lined with pre-cast concrete rings, one of which is still lying around, some of the technology and lessons learned were later used to construct the Channel Tunnel. A small notice reminds you that Elizabeth Woodville married Edward IV here in 1464, Henry VIII parted company with Cardinal Wolsey 65 years later and the local palace was destroyed in the Civil War. Buy a CD and you can learn more amazing Grafton Regis facts. There were locks here initially but these were a temporary fix to get the canal moving by 1800. The first aqueduct was brick and collapsed in 1808 and was replaced first by a temporary wooden and then by this cast iron version that opened in January 1811. The first railway works were built in 1836 and four years later employed 700 people, the royal train was even designed and built here. But time moves on and, although there is still some local railway related employment, Wolverton Park, a residential and commercial development, has taken over the old carriage works. . The canal was originally carried on an embankment but when Grafton Street, a main artery into the heart of the city, came along the first aqueduct had to be built on the Grand Union for fifty years. It took a year, required 1700 tons of concrete, 121 miles of steel, cost £4.5M and opened in March 1991.